Congrats to Los Angeles hockey fans everywhere (especially one in particular). 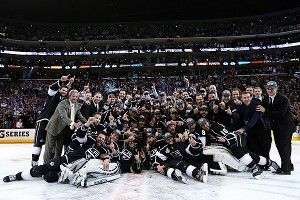 Your Kings are Stanley Cup champions! The Kings home ice is across the street from Grantland HQ, so naturally, we’re thrilled about this victory, which was a long time coming. Thank you for not burning down our Starbucks on Monday night. After L.A. made the Stanley Cup finals late last month, Grantland editor-in-chief Bill Simmons sat down with Kings forward Dustin Penner to discuss the team’s playoff run. You’ll find links to the pod after the jump.